Small Louis XVI tulipwood four-fold Chinoiserie Screen with double-sided Chinese watercolors. The lower portion of the screen is in the form of open trelliswork in Chinese style, probably influenced by the engravings of Sir William Chambers. 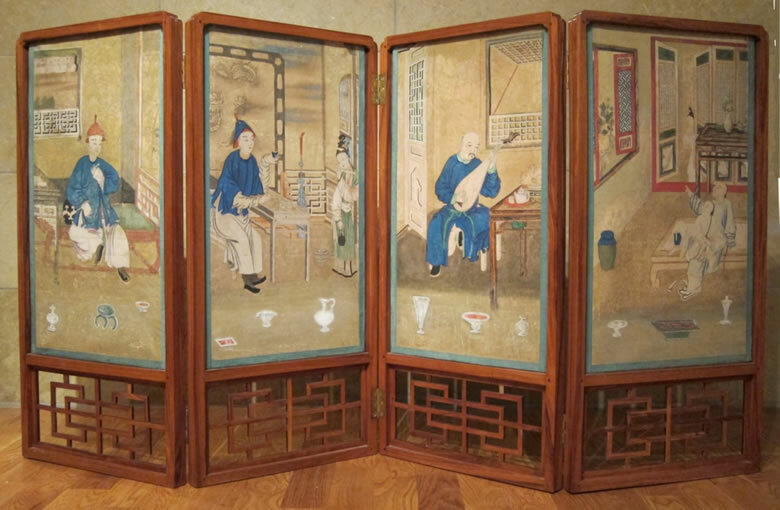 The watercolors depict Chinese genre scenes showing playing music, drinking tea, and embroidering in various interiors. The undersides of the frames are branded with a “CP” separated by a crowned anchor, the inventory mark of Chanteloup when owned by the duc de Penthièvre who acquired Chanteloup from the estate of the duc de Choiseul in 1786. The screen is probably the one mentioned in a description of the decoration of the Duchess de Choiseul’s bedroom, “…two screens, one with a writing surface and panels of green taffeta and the second, of small dimensions, garnished with Chinese paper” cited on page 108 of Chanteloup, un moment de grace autour du duc de Choiseul: Somogy; Paris, 2007. The only architecture remaining of the château de Chanteloup is the famous seven storey Chinese Pagoda, probably the largest remaining 18th century “folly”. The duc de Choiseul, a famous collector of Chinese art and Chinoiserie, was exiled to Chanteloup because of court politics from 1770 until the death of Louis XV in 1774.